Realme Philippines announces its participation in the highly anticipated Shopee Summer Bazaar on April 4, 12MN by offering the realme 3, the budget and midrange disruptor, at a special discounted rate of Php6,490 from its retail price of Php6,990. First time Shopee users are in for an even exciting treat because they can get an additional discount to further lower the device’s price to Php5,970 by using the special promo code GADGETZONE8 upon checkout. Stay up-to-date on all things realme by following its official Facebook, Twitter and Instagram accounts. 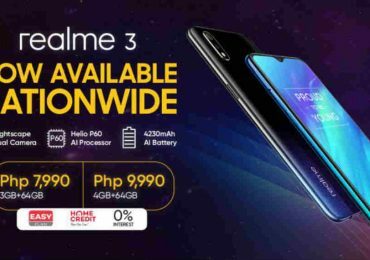 Available first in stunning Radiant Blue color, realme 3 is definitely the hottest smartphone for the summer.